Vordt, an outrider knight, keeps an eye on the main gate that leads from Lothric to the outside, and is able to teleport to new locations through the use of a portal. 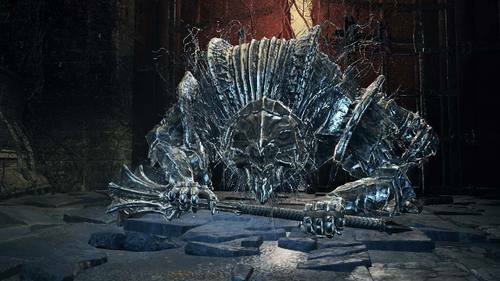 Outrider knights are known to eventually devolve into beasts — he is referenced by Emma, the High Priestess, as a "dog", and his movements are animal-like — and are "constantly hounded by Pontiff Sulyvahn black eyes" [Irithyll Straight Sword], possibly indicating that the knights of the boreal valley are tied in some way to some form of religious organization. Vordt is known to never be far from the Dancer of the Boreal Valley [Soul of Boreal Valley Vordt], in a way fitting of his image as a loyal dog. Soul of Vordt of the Boreal Valley. One of the twisted souls, steeped in strength. Vordt served as an outrider knight, never far from the fleeting dancer. Great Hammer wielded by Vordt, the outrider knight of the Boreal Valley. Weapon is imbued with frost, and causes frostbite. Frost accumulated in the body causes frostbite, which saps one's health, lowers absorption, and slows stamina recovery.